Navigating the life insurance landscape is an oftentimes complicated and emotional journey, but you don’t have to go it alone. We’ll be your guide every step of the way towards matching you with a policy tailored to your unique circumstances, from quality providers that we wouldn’t represent if we didn’t trust them with our own lives. Because you shouldn’t just feel like you’re prepared for whatever the future holds - you should know without a doubt. That’s the Finlan difference. While it can be difficult to think about, term life insurance can significantly impact the well-being of your family’s future. Term life insurance provides coverage for a certain time period and is specifically designed to protect your loved ones should the unthinkable occur. If something happens to you within the covered period, your beneficiary will receive the full amount on your policy. Term life insurance can help cover expenses that could be debilitating without it, such as loss of income, debts, or can even help your family pay for college or pay off a mortgage. The term length of your policy is selected at purchase, with many people typically opting for 10, 20, or 30 years of coverage from the time of writing, during which period you’ll pay monthly or annual premiums. For example, if you purchased a 30-year plan at the age of 41, you’d be covered until the age of 71. If you’re considering a life insurance plan, we are here to help you understand your options, and which is best suited to you and your family. Many times, our clients have specific goals in mind as it relates to life insurance and we work to evaluate the packages offered by our carriers that offer the best benefits for their situation specifically. At Finlan, we are people first and insurance agents second, so we know firsthand how bittersweet the conversation about life insurance can be. That’s why we make it a point to not only help you explore your options and select the best possible coverage, but to listen and learn about the extraordinary life that it reflects. Unlike term life insurance, whole life insurance does not expire after your policy term ends. 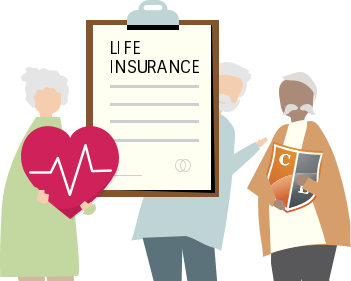 It provides permanent, lifelong coverage and it can also offer additional benefits in comparison to other types of life insurance. One benefit to whole life insurance is the investment aspect referred to as cash value. Your policy’s cash value will grow tax-deferred over time, meaning that you are not required to pay taxes while it accumulates. Depending on the policy, you can also earn annual dividends which can be paid out in the form of cash, left on deposit to gain interest or reduce your premium, used to repay policy loans, or purchase additional coverage. Further, you also have the ability to borrow money from the policy in the form of a loan or surrender it entirely for cash, however it is important to realize that doing either can have consequences. Depending on your goals and concerns as it relates to caring for your family’s future, we can help you understand whether a whole life insurance policy is your best option, as well as explain the other types of life insurance available to you. A universal life insurance policy is very similar to whole life in that it provides permanent coverage for the entirety of your life and includes the beneficial cash value investment aspect. However, while a whole life policy offers fixed premiums that require you to pay the same amount every year, a universal life policy offers flexible premiums and coverage amounts that may be adjusted by accessing its cash value. For many people, this option provides an added level of convenience and peace of mind knowing that their life insurance policy is able to adapt to unexpected changes in personal circumstances, in addition to ensuring that their loved ones remain protected. We know that searching for life insurance coverage isn’t always easy, but we want you to know that we’re here for you at every stage of the process, making sure that you fully understand your options and helping you select coverage that’s as unique as you are. Annuities are similar to whole life insurance in that they are paid into over the course of your life, but they aren’t solely for your family’s financial protection after you pass. They can be used to provide you with a steady cash flow in your retirement years, or help you build a substantial nest egg. Annuities can also be used from an investment perspective to prepare for your later years in life in the event you receive a large lump sum of money, such as winning a lawsuit or the lottery. Variable: This kind of annuity is the best for building a long-term nest egg. Taxes on your earnings are deferred until withdrawn, although there is no tax requirement if you begin withdrawing after 70.5 years of age. You also have the option to pass assets directly to your beneficiaries, which avoids delays and costs associated with probate court. Income: This kind of annuity provides you with guaranteed income in retirement, which is based on your lifetime, the lifetimes of you and another person, or a fixed period of time. You also have the freedom to choose how much income you need and when you’d like payout to begin. You work hard, and you deserve the security of knowing that you’ll be able to enjoy the fruits of your labor in retirement and that your loved ones will be protected when the unthinkable occurs. It’s never too early to start planning, and the Finlan team is here for you throughout the entire process to carefully evaluate the unique aspects of your life, and help you select an annuity that’s specifically tailored to you.